I don't want the Nautican army to become too fast moving or cavalry-like but I'm wondering if I should include a dolphin. Maybe just one (like the Great White Titan shark) for Siren magic users only. I'm going to have a look around for suitable miniatures first. The pic is from the reapermini.com painting contest. Images from reapermini.com are used with permission. All their rights are reserved. if this is still open to be commented on then dolphins i dont think would fit in too well... Dont really think they would but cant place why... I can't see a squad of them floating around a battle field, i can see a great white titan since its a hero mount.. Thanks for the comment Kristian. I decided to leave dolphins out in the end. 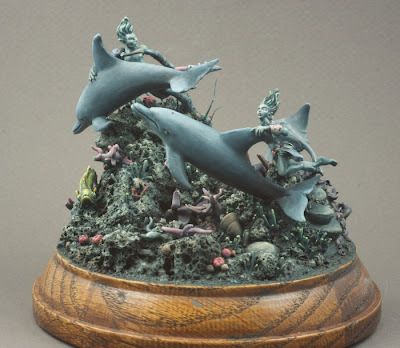 I was keen on having them as mounts for sirens but I simply cannot find any suitable miniatures so they have been consigned to the archive ! These are good Units. You should add them as Mounts. Every army needs a fast moving Units, even Ogres have Gnoblar Trappers.